Hello everyone, users of mobile - by the way, very good - devices based on iOS operating systems - iPad tablet computer and iPhone smartphone. In today's material I will tell you about the programs that will help you recognize any musical composition (music). Why actually need it? There are many reasons to use applications for recognition, one of them - and, in my opinion, the main one - is to find out which track is currently playing. I think you got into such situations when you hear some interesting and fiery song, but to understand what kind of song it is and who performs it is absolutely impossible. Here come to the aid programs for the recognition of musical compositions (music). The quality of music recognition. This (music recognition), of course, is one of the most important principles of working with programs for the recognition of musical compositions. Of the ten proven compositions, all ten were recognized by both programs from the selection I proposed. Works with Russian performers. This is a very important point of the program. I also tested each application (iPhone and iPad) for the recognition of tracks (music) of Russian-speaking groups. So let's go directly to the collection. Links to each application (iPhone and iPad) can be found in the description of each program from the selection. Download found songs to iTunes. Very interesting and useful feature that helps you to save the found and recognized composition. You can also watch clips of the songs you found on the YouTube video hosting. 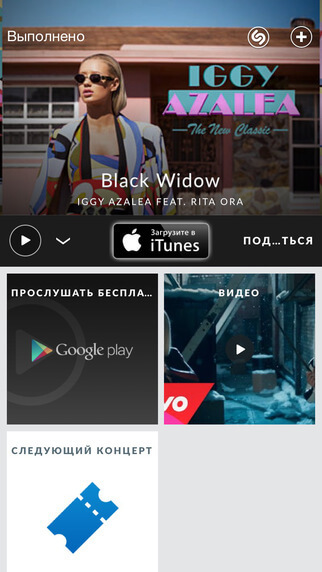 You can access the recommendations of users of the Shazam application. Thus, you can find a lot of good music for yourself. 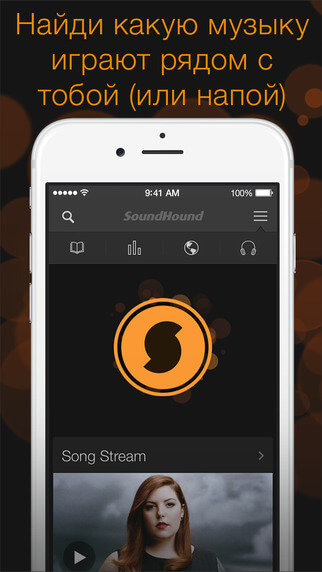 You can download this application from the link that is published above..
Fast recognition of songs. The application “can” recognize musical compositions rather quickly, which is good news. The ability to access charts where you can find out the most popular songs. Built-in player to listen to recognized music. Today this is all, I hope this collection was useful for you. If yes, then you can share your opinion in the comments to this post..